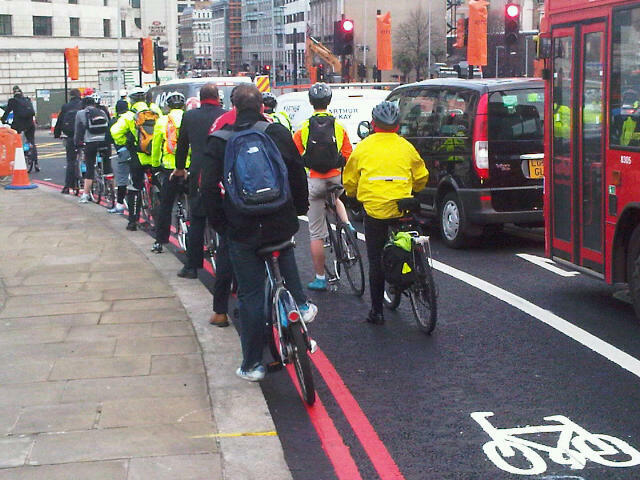 Cyclists in the City: Blackfriars: TfL finally hints at a compromise to make the junction safer for cycling. It's not perfect but it's a step in the right direction. Blackfriars: TfL finally hints at a compromise to make the junction safer for cycling. It's not perfect but it's a step in the right direction. ﻿ As I came to work this morning, I cycled over Blackfriars Bridge. Lots of people on bikes, as usual. The new road layout has more or less settled down over the last couple of weeks and I've been waiting till the whole thing is finished to give a final verdict. I have to say, the northern junction is pretty grim. There are some good bits. The cycle lane pictured above is now wider than it used to be. The lane used to narrow at this point, creating a rather hairy pinch point. But to turn right from this point is very trying indeed. As I suspected when I first saw the plans a year ago, you have to get yourself across three lanes of motor traffic to get into the right hand lane. Motor drivers are accelerating off the traffic lights and all of a sudden, half a dozen people on bikes try to fling themselves across all three lanes. You see people taking the lane, you see other people weaving between lanes, you see some people cycling into the right hand lane well in advance of the junction on the bridge itself. Basically, it's a complete free for all. It's not predictable for people whether they're on a bike or behind a wheel. Frankly, it's downright dangerous. And as I've repeated for over a year, it's outrageous that there is virtually no provision for safe crossing of this junction on a bicycle, when you consider that cycle 'traffic' here is the largest single mode of transport at rush hour. I asked a colleague of mine to try cycling over the Bridge and turn right into Queen Victoria Street. That colleague is a police road safety officer. He picked up a Boris bike and gamely cycled over the junction at rush-hour. "Hmm, I see what you mean," he said. Things, however, work in mysterious ways. Last year, thousands of people protested on this bridge about the design of the junction. They came out several times to make the message again and again, that the design was inadequate. The issue was brought up to the London Assembly and to the Mayor. And some initial changes were made. If you come into the junction from Queen Victoria Street, you'll notice a new bike lane alongside the two motor vehicle lanes. That bike lane was not part of TfL's original plan. They went back to the drawing board and 'magically' created some space for a bike lane. So that's good. There's also an advance stop box on the right filter into Queen Victoria Street now. Frankly, I think the advance stop box is utterly pointless. You can't access it unless you're ahead of the queue of motor vehicles or unless you like darting in front of HGVs (bad idea). Not good. Then last week, Transport for London issued a press release about the killer design it had installed on a brand new cycle super highway at Bow Roundabout. 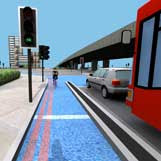 The design features a segregated bike lane into the roundabout with separate traffic lights for people on bikes who can then pull away from the junction ahead of motor vehicles. The design isn't perfect but it's a start. "TfL will closely monitor the performance of the early start facilities (at Bow), and has now begun to look at other junctions across London where this technology could also be introduced to provide a safer route through junctions or roundabouts, including potentially on Blackfriars bridge." Bow roundabout design. Coming to Blackfriars? I think this is a strong hint that TfL is considering whether it might be possible to install a separate cycle traffic light on Blackfriars Bridge. My own view? I think that would be fantastic news. 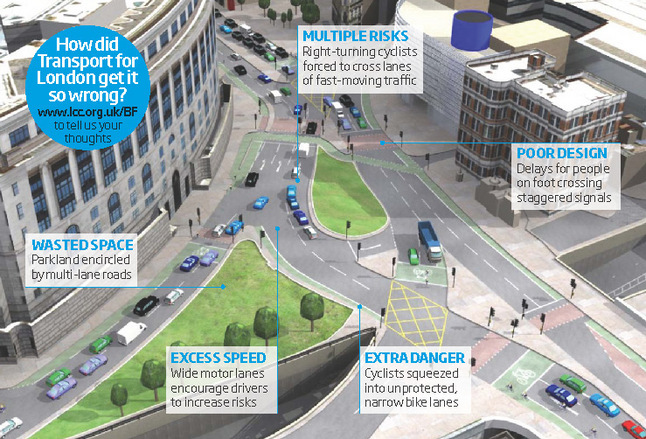 I would far rather see a proper solution, similar to the design by London Cycling Campaign here. But as a first step to sorting out this horrible junction, a well-planned (and only if it is well-planned, with good traffic light phasing and enough space to let people cycle well ahead of the motor traffic before the lights change) cyclist-only traffic light would allow people to cycle past the motor traffic and get themselves into a safe position for turning. What's more it would keep motorbikes out of the bike lane (which is a constant issue here). Put simply it could allow people to position themselves ready for the junction to turn right, without having to weave in between three lanes of motor traffic. As a quick-fix solution, it could turn a horribly dangerous right turn across three lanes into a much simpler and safer manoeuvre. I think we also need to see improvements at the southern end of the Bridge as well. The National Cycling Network crosses into Upper Ground here but is a complete shambles with pedestrians and people on bikes fighting for a tiny amount of space on a central traffic island and there is masses of space given to motor vehicles (four lanes heading south), which makes for race-track driving conditions. There's a complete lack of safe crossing facilities for pedestrians as well - you just have to fling yourself across Stamford Street in the hope of making it between motor vehicles. Both sides of this bridge need to be made safe places for people on bikes and on foot. And I sense just a glimmer in that TfL press release that something might be on the drawing board. It doesn't sound perfect. But it sounds a lot better than what we've got at the moment. I'm not too keen on these "early start" lights that they are installing at Bow. From what I've red it's simply a seperate light controlled bike filter lane to "allow" you into the ASL. Good in theory but the whole things falls apart as there is still no way of ensuring the ASL is actually going to remain clear. Only this morning I was waiting to head onto Vauxhall Cross from South Lambeth Road and having arrived at the ASL just as the lights changed I had the whole thing to myself (the rest of the riders diverted onto the dire cycle bypass route), that was until about 30 seconds later when one of those big double decker red "bikes" rolled up alongside me. The turning right off a bridge problem isn't unique to Blackfriars though, I face similar challenges with Vauxhall Bridge daily as I head over and turn down Millbank. Depending on traffic I can usually filter across the 2 lanes on the approach or even take the right lane and hold it coming over but it's not ideal. I'm a fairly quick and confident rider but there's no way I'd expect a novice to carry out something like that. For them rolling up to the far end and using the ASL to move across is probably the safest option. But as you say I guess at least it shows TFL are thinking about it now, however I'd much rather see them implement some proven solutions from abroad rather then try and come up with their own solution - god knows how much that cost in consultant design fees! Now that the road has been resurfaced and painted we can see what Blackfriars Junction is intended to be like. I would say the whole sector from Stamford St to QVS/NBS is a bit of a curate's egg - if you want to make a straight N-S trajectory over the bridge and up or down New Bridge St it now works reasonably well, although I don't really understand why the southbound bridge lane could not have been solid-lined as a mandatory lane. Right turns are not nice though, and the predictable response (possibly not articulated yet by TfL) that you can slip left at the lights, wait for them to change and then cross as a pedestrian, would be pretty unsatisfactory. One day last week, riding over from Waterloo at around 9am, I was particularly struck by the volume of cycle traffic. I was lucky enough to meet green lights all the way and the motor traffic was therefore fairly spread out, so the typical effect as seen in your photos, where bikes back up at a red, was missing, and yet there was a veritable phalanx of cycles, I would estimate 30-40 strong, moving freely together and really owning the road. It was just co-incidence that they were there together (and the fine weather may have played a part), but it did feel a bit like a mini flash-ride or critical mass. Does that mean things are good enough? Hell, no. I read on a blog the other day that Britich cyclists have in the past been too timid in their demands, and what is needed is more ambition - stop asking for crappy lanes and "hierarchy of provision" and start asking for Dutch standard facilities. Perhaps so, and there is no doubt that our realism needs to temper a truly ambitious vision, but I don't think it is so much the ambition of our demands that needs to rack up as the insistence - whatever we ask for, we need to make sure that we aren't going to be given the runaround any more. We probably don't have a Kindermoord movement yet, but it is building up and the pressure needs to be kept up. Hopefully, they will make sure there are no repeater lights on the junction at Bow - so cars will have to stop behind the stop line, out of the ASL, to see the lights. Yes, southbound to victoria embankment is equally dangerous - needs a separate lane and advance lights too. The Stamford St junction could benefit from the same kind of changes - a segregated lane up to the lights, and a pre-green. Can I just flag up a potential bail out option that I use when tackling Blackfriars Bridge to Queen Victoria Street. It's not great but it's a good fallback if you are stuck on the left when the lights turn green and you don't fancy hurling yourself across three lanes of traffic. If you look at the junction diagram at the top you will notice a new bike lane on the left that rises onto the pavement at the bottom of New Bridge Street and then diverts cyclists onto a pedestrian/Toucan crossing. Having meandered across the central island and another crossing, it connects with the southbound lane on the bridge. The purpose of this lane is to let cyclists coming from the Embankment turn right onto the bridge. If like me you really want to turn right up Queen Victoria Street, you can also take this route to get across to the far side of the bridge. From there, hop onto the pavement, scoot north to the pedestrian crossing on Queen Victoria Street, turn right and resume your journey. If it's busy you might have to walk that section, but whenever i've done it, there've been so few people about I've not bothered. What would make this even better would be a special ASL on the lane from Blackfriars Bridge to Queen Victoria Street. Cyclists could use the bail out lane and crossing to get themselves over to the right hand lane ready to go when the lights change. It would just need a bit more space for them to wait in, so they don't clutter up the cycle crossing. At the moment, you could wait there anyway but I haven't checked it out to see if you can still see the lights, and I won't wait anywhere where I can't see the lights change. If anyone else hase tried this workaround, I'd love to know how they find it. It's a bit clunky, and slows you down a bit, but it's a god send when it's dark and I'm feeling nervous. I was in London this week as a pedestrian and I must say that cycling around London looked terrifying. I'm sure that any improvements like this will be greatly welcomed by cyclists! The picture at the top is fantastic. Fantastic that is at showing that most cyclists just fail to see the point about cycling assertively. An entire row of them blindly sitting over the double lines with one foot on the kerb. All they're doing is further encouraging any traffic to overtake. As you've said, trying to turn right here is a nightmare, and hardly anyone in your illustrative photo is doing themselves any favours. Given your Policeman friend and the comments on the junction, how about a press release to the Evening Standard on the lines of "Police condem brand new junction as dangerous"? Then go on to ask how Boris has managed to waste your and my money on something unsafe even for police officers. Might be one for the voters to ponder. Monchberter: These are the kind of comments which really make me annoyed. "All they're doing is encouraging any traffic to overtake". Wrong. All they are doing is what the road design is making them do. It's not their behaviour which is "wrong", it's the design. Can we stop blaming the cyclists please for not wanting to force themselves in front of tons of poorly-controlled high-speed metal? Perhaps it's not that "cyclists just fail to see the point about cycling assertively". Perhaps it's just that they are average humans who don't wish particularly to "assert" anything, they just want to get to work in comfort. Perhaps they should allowed to be that, and do that, and do it on bikes. Anyway, the indication that TfL could be tiptoeing towards better junction solutions is very good news, and a sign that everybody should keep the pressure up on the mayoral candidates to rethink road design priorities. Stop blaming the cyclists, blame the designers. I read a tweet which said that David Arditti had written a particularly good reply here, and indeed he has: "Stop blaming the cyclists, blame the designers" indeed ! However, I disagree that the tip-toeing is particularly good news. The lack of an ability to take decisive action which really improves the streetscape is a good part of the problem in Britain. A few minor improvements here and there, while conditions erode slowly in other locations, does not make for real change. Advanced stop lines should not be seen as aspirational. Lights which attempt to give cyclists a slight head-start at huge junctions are also not effective interventions to produce safer cycling conditions for the masses. Rather larger steps are required, with more effective interventions than are being called for. Only then will real progress start to be made. Don't let the mayoral candidates get away with supporting no more than was called for by the low standards set by the LCC and The Times because this is simply giving the politicians another chance for the type of cop-out which politicians have been passing off for progress for the last 30 years. Joe Dunckley has recently been documenting these things. Monchberter - there is nothing to suggest any one of those cyclists wants to turn right. Assuming they want to continue straight on (which seems to be to the left of the photo), using the wide cycle lane seems to be the right thing. Assuming I am looking at the right part of the map of the junction (the bit where you could turn right into Victoria Street) there is no left turn...what is the issue? I cycle assertively there, and mix it with the lorries and motorbikes at the front and in the rh lane, and even asserting myself it is a horrible junction which has been made much much worse. When the main lights are red, the ASL light will be green. Cyclists will proceed into the ASL and wait on the main red signals. When the main lights go green, the cyclists in the ASL can proceed, along with the motor traffic. Therefore the cyclists are given the extra time that is proportionate to the depth of the ASL. When the main lights are green, the ASL entry lights are red to prevent cyclists proceeding into the junction and potential conflict. 1) The scheme will be rendered useless if traffic encroaches the ASL. With tailbacks at peak times, traffic may be in the ASL perfectly legally whilst the main lights turn red. 2) Cyclists are being penalised in time. They either wait one red light (arrive at main red with the ASL on green) or have to wait for two traffic light cycles (wait for the ASL light to go green and then for the main lights to go green). Both these issues render the scheme very deeply flawed in my opinion. I have seen no detail on how the scheme will work other than the videos, so can only hope I am wrong. But from what I can see this isn't a cycle priority light that would be fine, but a scheme which tries to limit interaction without affecting traffic flow, but impedes cyclists. it`s the attitude from motor vehicle drivers to cyclists that needs to change ! !